The FOB bracket is a sturdy aluminum bracket that should not twist or move in the wind, and won’t rust. The ‘teeth’ or stops on the bracket are to keep the housing from moving. Make sure that the structure you are mounting the bracket and camera to is strong and steady. Finally, adjust your DVR software so small movements will not trigger a motion alarm. The FOB is the standard outside bracket offered by most distributors. 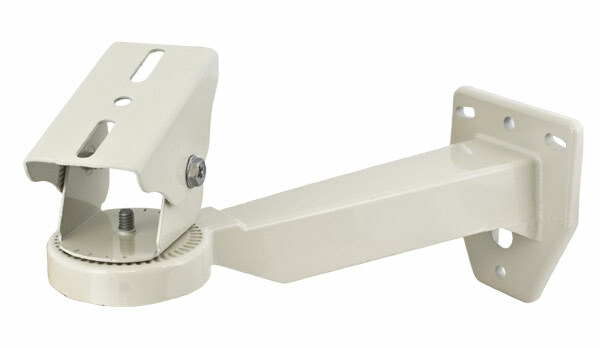 For tricky situations you can buy a heavier duty bracket from a manufacturer like Pelco but they are not cheap. I mounted 2 of these outdoors. On even slightly windy days I get repeated false motion alarms due to the bracket twisting in the wind. Also I did not like the the way the stops on the mount prevent me from setting the vertical position exactly where I want so it aligns with the motion detection blocks on the dvr. I would prefer it to be infinitely adjustable without stops.